Sunidhi Chauhan believes that as a judge she “brings a lot of positivity” and offers “help to the contestants, if needed. “It has been a roller coaster ride for me. I have experienced a lot of amazing things; I got a chance to sing some of the best songs. Right now, it’s a new beginning for me. Once again, I feel the way I did when I was 14 years old. There is a different energy and a major addition to my life now — my son. There is no bigger miracle in this world than giving birth to a child. The only magic that exists for me now is this,” says Sunidhi Chauhan. Barely three months into motherhood, the singer has dived into work again. She is busy promoting her new reality show, The Remix on Amazon Prime, that she shot for during her pregnancy. Still unsure about how motherhood would impact her career, she is looking forward to taking the stage again. “For me, it’s not work but passion. As soon as I felt good, I resumed work. I will take up more projects,” says the 34-year-old, who debuted as a playback singer at the age of 11 with Shastra (1996) and won the television talent show Meri Aawaz Suno at 14. 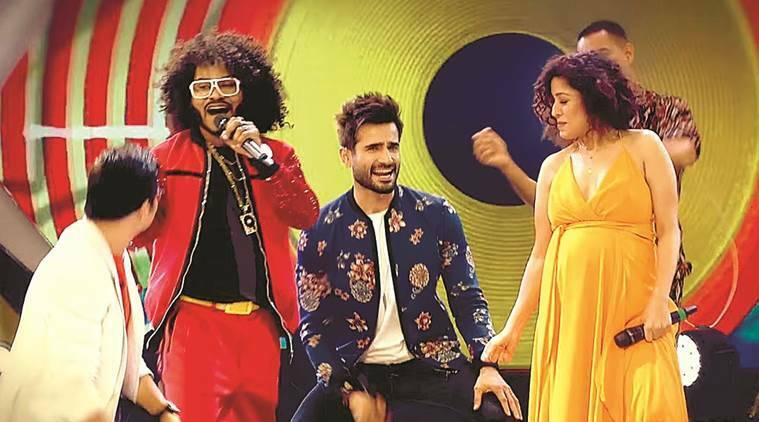 The Remix, which launched earlier this month, pairs a singer and a DJ, who reshuffle and remix popular Hindi film songs. Along with Chauhan, music composer Amit Trivedi and DJ Nucleya are judging the 10-episode series. “These days everyone is doing remixes and they sound like a repetition of the last,” says Chauhan, adding that she appreciates remixes only if they are “tastefully done”. extremely talented. That doesn’t mean they don’t need advice,” says Chauhan. The experience is also enriching for her. “You are exposed to so many talented people. They come from all parts of the country. They are innocent and curious. It’s amazing to talk to them about their desires,” says Chauhan, who enjoyed instant fame with songs such as Mehboob Mere (Fiza) and Ruki Ruki Si Zindagi (Mast). Sunidhi Chauhan Chauhan on the sets of The Remix. Known for her robust and powerful voice, Chauhan says: “I have the gift of that voice. I am proud of that. It’s liberating.” She is now keen to work on “independent” projects alongside playback singing. Singing ghazals, too, has been on her mind. “If I can, I would like to do it tomorrow,” says the singer who featured in a remix of Enrique Iglesias’s song Heartbeat in 2011. Another international foray might materialise. “It requires spending a lot of time away from home. It’s in the process, though nothing concrete has come up yet,” she says.